Some people have a purpose. A calling. That one thing they were born to do – that one thing that fulfills them in a way nothing else can. 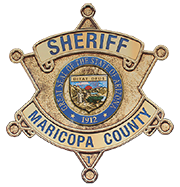 At the Maricopa County Sheriff’s Office, we are one. One with dedication. One with integrity. One with commitment. run jails in the country. Competitive Pay with a comprehensive benefits package including retirement security, paid holidays and vacation, a 24/7 gym and more. Do important work while helping safeguard our communities. Are you ready to become one with opportunity? Maricopa County is an Equal Opportunity Employer. Pursuant to the Americans with Disabilities Act, Maricopa County will make reasonable accommodation(s) during the employment process. In addition, Maricopa County complies with A.R.S.§23-211 et seq. and submits information on all new hires to e-Verify. Finally, Maricopa County complies with A.R.S.§36-601 (Smoke Free AZ Act) and prohibits smoking in all places of employment.